A while back I posted about Inner Mongolia, which made me remember a fun little incident that happened when I was studying abroad in China a few summers ago. Some of my classmates and I were taking an overnight train ride to visit Heng Shan (Mount Heng), one of the “Five Great Mountains” of China. 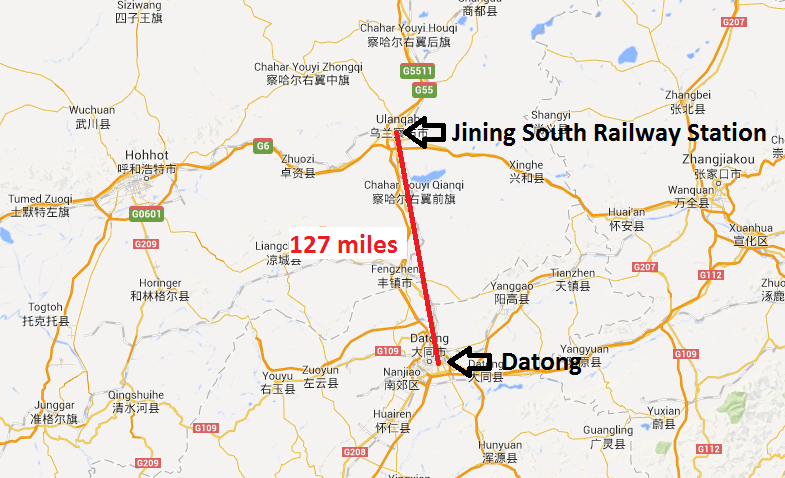 We would get off the train in the city of Datong, and then take a bus to the mountain. Well, the train was supposed to arrive at the Datong stop at, let’s say, 6:30am (I obviously don’t remember the exact time, but it was early in the morning). So we had planned to wake up around 6:00am to have time to rub the sleep out of our eyes and gather our stuff. Which is what we did. 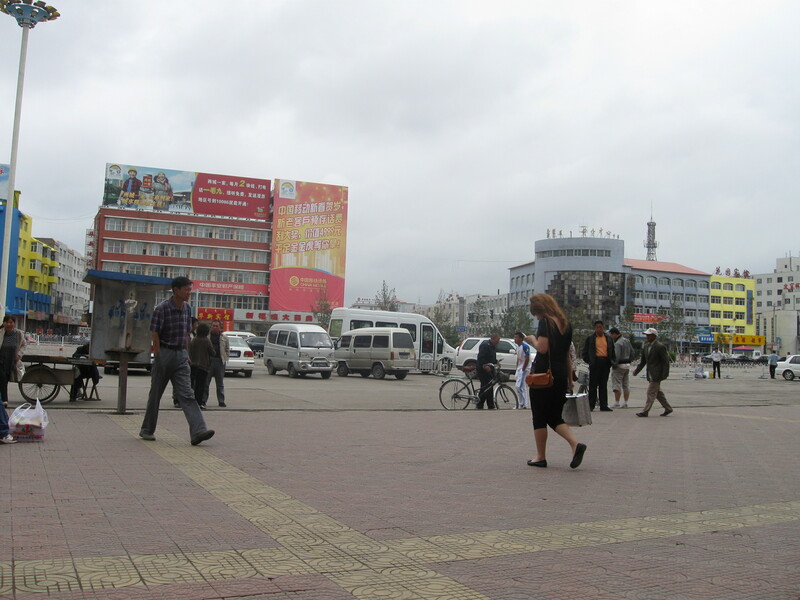 We woke up at 6, and then we waited to arrive in Datong. 6:30 passed, and the train still hadn’t stopped. An hour or so later, as we were cursing the inability of Chinese trains to run on time, a voice came over the intercom to announce that we were about to arrive at the Jining South Railway Station. * Now, my Chinese language skills were basically nonexistent at that time, but I definitely noticed that the word “Datong” never featured in that announcement. We were very confused. Where the hell were we?! 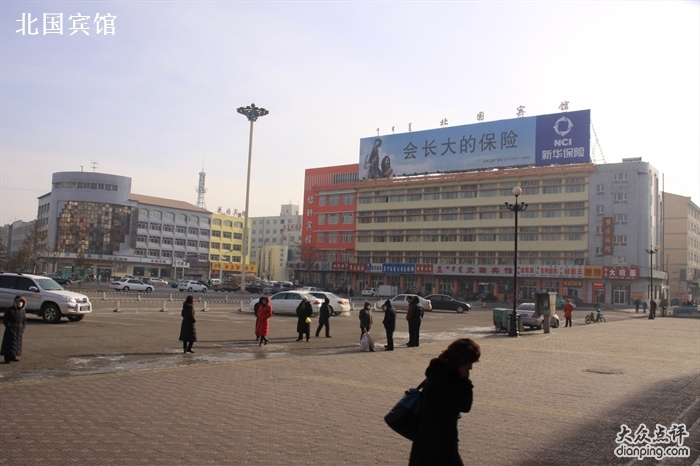 Yes, as some others passengers kindly informed us upon seeing/hearing our confusion, we were arriving in Jining District in the city of Ulanqab in–you guessed it!–Inner Mongolia! Apparently the train had arrived at the Datong station way ahead of schedule (at least 30 minutes early, as we had woken up 30 minutes prior to when we were scheduled to arrive), and just kept going on its way with us none the wiser. As we were now 127 miles from where we had planned, our new Chinese friends (a university student and her mother, hereafter referred to as “Awesomely Helpful People” [AHP]) suggested we get off at this station and catch the next train going the other way. As AHP lived in this area and were getting off at this stop anyway, they helped us get new train tickets to head back to Datong. As our train back to Datong wasn’t arriving for another few hours, AHP invited us to a restaurant to enjoy a traditional Mongolian breakfast! Apparently a Mongolian breakfast consists of steamed meat-filled buns, boortsog (a type of fried dough), and milk tea, or suutei tsai (Mongolians love them some milk tea). I will admit that I don’t really remember what any of this stuff actually was (other than the milk tea; it’s hard to forget what a giant boiling pot of beige liquid is), but that’s my best guess based on the little bit I’ve discovered about Mongolian cuisine at this point. 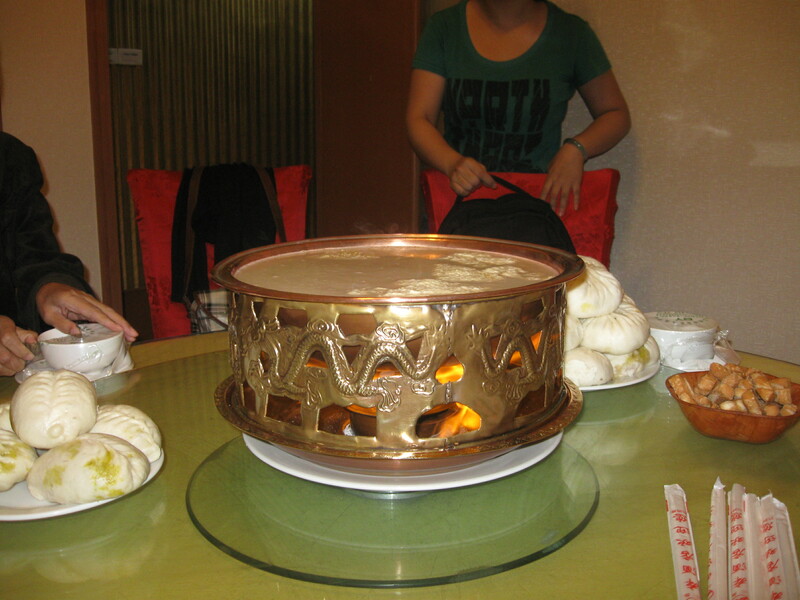 Those big steamed buns up there definitely look like baozi, which is a common Chinese dish, so I’m not sure how “Mongolian” they really are (Wikipedia tells me that the Mongolian equivalent is buuz, but those seem to be more like dumplings rather than buns). And I really have no idea what those little brown sticks are, though the Mongolian boortsog is basically just fried dough, so I’m gonna go with that. And I can’t tell you how any of this stuff tasted (except the steamed buns–those things are delicious!) as this was well over 3 years ago and I never thought I would be eating Mongolian food again. I sure hope milk tea tastes good (or at least tolerable) as I’ll probably be drinking it every day during my 27 months in Mongolia. Notice how the building in the left of the first photo looks an awful lot like the building in the right of my photo below it? Mystery solved! So, apparently Mongolia has a navy. Let that sink in–Mongolia has a navy. For the record, Inner Mongolia is not actually part of the country Mongolia. 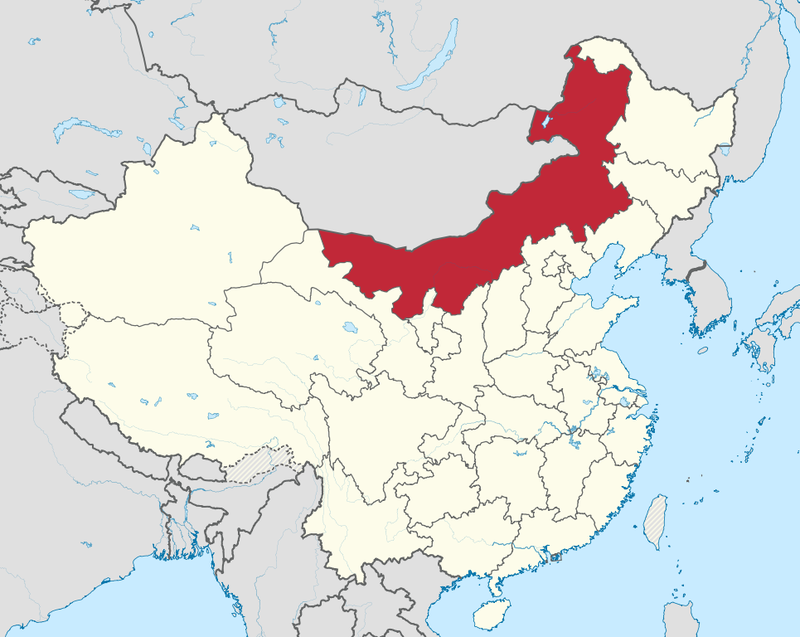 Inner Mongolia (officially the Inner Mongolia Autonomous Region) is one of five autonomous regions in China, similar to other Chinese provinces but with more legislative rights and with a higher population of a particular minority ethnic group (e.g., Mongols in Inner Mongolia). Mongolian is an official language in Inner Mongolia (along with Chinese), but it is written in the Mongolian script rather than the Mongolian Cyrillic alphabet currently used in the country of Mongolia. I’ll probably do another post in the near-ish future regarding the Mongolian language and writing system(s). In addition to applying for your no-fee passport and visa, after accepting a Peace Corps invitation you must obtain Final Medical Clearance. As early as 6 months before your departure date, the Office of Medical Services will load a bunch of tasks to your medical portal. You have until 2 months before your departure to complete all these tasks, so they strongly recommend that you make your appointments as soon as the tasks become available. The cost-share allowance for the dental exam and x-rays is $60, and for those who need corrective lenses, the cost-share allowance for visiting the eye doctor is $12. If you don’t have dental insurance (or, if you’re like me and got kicked off your parents’ dental insurance plan right after getting your invitation because you turned 24 that year) I have great news! Certain Fellows of the International College of Dentists have amazingly offered to provide dental exams and x-rays to Peace Corps applicants at no charge! As in FREE!!! Just follow this link http://www.usa-icd.org/projects/peace-corps/, click on your state, and search for a dentist in your area. Now, obviously some states will have more Fellows offering this service than others, so I can’t guarantee that there will be one near you. There are over 50 here in Georgia, and one of them was conveniently less than 15 minutes away from my home, but if you live somewhere like Arkansas, you only have 4 dentists to choose from, and if you don’t happen to live anywhere near any of them, tough. If one of these dentists is convenient to you, call their office and mention that you’re a Peace Corps applicant who saw online that Dr. So-and-so does free dental exams for Peace Corps applicants. If the receptionist is anything like the one I talked to, they’ll have no idea what you’re talking about, ask all the other receptionists and hygienists in the office, and finally just go to the dentist him/herself to confirm that it’s true (I guess there aren’t many Peace Corps applicants in my area…). Once you set up your appointment, just be sure to bring all the necessary Peace Corps dental paperwork with you to the appointment. And try to get your x-rays in digital format so you don’t have to spend $15 shipping the films to the Peace Corps headquarters (but seeing as how I was getting this all done for free, I did not want to ask the dentist to give me digital copies after he handed me the film x-rays). And then be sure to thank the dentist profusely for everything! You’ll also need to schedule a physical exam and get a ton of lab work and probably some vaccinations as well. Luckily, most insurance plans do allow you to get an annual physical for FREE! So unless you’ve already used up your year’s physical exam, this should be pretty easy to set up, and you can likely get everything done at once. When you schedule your appointment, be sure to tell them which immunizations you’ll need (for example, I needed boosters of polio and tetanus/diphtheria) as some doctor’s offices don’t carry all vaccinations and you may need to visit a travel clinic for some of them. Some insurance plans may cover these immunizations as they’re considered “preventative,” but others won’t, so you may want to call your insurance company first to find out what they cover. You’ll need to get a TON of blood work done and get a TB test, but it’s all on the Peace Corps physical exam form, so just give the whole thing to the doctor so that he/she knows what you need. And again, insurance companies will differ on whether (or how much) they cover these tests; the lab work ended up being the most expensive part of my exam. And finally, make sure the doctor fills out everything on the forms! Make sure they sign everywhere it asks them to sign and they check every box that needs to be checked. Get copies of all your lab results and proof of immunization for all the vaccinations, as you will need to upload these to your medical portal. For the vision-impaired among us, you will also need to visit an eye doctor to get an up-to-date prescription for eyeglasses. The Peace Corps strongly discourages volunteers from wearing contact lenses while serving, as the hygienic conditions of most Peace Corps posts make it difficult to properly clean and store contact lenses and raises the risk of infections. Some volunteers use the daily disposable contact lenses to get around this issue, but of course none of those lenses come in my particular prescription. So, unfortunately for me, I’ll have to give up my precious contacts for a couple years and am in the process of finding some cute glasses that I won’t mind wearing everyday. But holy crap are glasses expensive when you have a super strong prescription like mine!